PRESENTATION OF DRDO AWARDS -2013, a photo by Chindits on Flickr. The Defence Minister Shri AK Antony today expressed optimism that the country’s indigenously developed fighter aircraft- LCA TEJAS- will get Final Operational Clearance of the Indian Air Force by the end of next year. Speaking at the Annual Awards Functions of DRDO here, he said, all stakeholders including the DRDO, IAF and HAL must put their energy together in a focused manner to achieve this objective. Shri Antony said countries that depend on imported arsenals cannot become great nation. Shri Antony said we continue to be the largest importer of Defence equipment. The share of indigenous content in Defence procurement is low. “Our experience has been that foreign vendors are reluctant to part with critical technologies. There are delays in the supply of essential spares. There are exorbitant price increases. The Services too realize that we cannot be eternally dependent on foreign equipment and platforms”, he said. Referring to the expansions of domestic defence industry, Shri Antony said this has to be achieved through public and private sector initiatives. He said there is ample scope for joint ventures also. “All the stakeholders in the defence sector- DRDO, Armed Forces and the industry must work in tandem and develop trust and confidence in each other’s capabilities.” Cautioning against time and cost over runs in projects Shri Antony said Indian Companies must compete with global players in developing state- of- the art technologies of acceptable commercial parameters and must meet customer satisfaction. The Minister complimented DRDO for their magnificent achievements in 2012. He referred to the first flight of Agni-V, two successful tests of our Ballistic Missile Defence programme in February and November 2012, first flight of LCA Navy, establishment of a cyber-forensics laboratory, initiation of production of NBC systems, ToT for composite armour for helicopters and investment casting of aero engine components and said these are just some of the many accomplishments. He, however, asked the scientists not to be complacent. “The DRDO must keep its focus trained on the areas of core competence and not fritter away its energy and resources. In today’s world of cut-throat competition, the choice is very clear-‘perform, or perish’. From designing stage to the stage of final production, timelines must be strictly adhered to and satisfaction of the end user is the litmus test of achievement”, he said. He said, the security environment in our neighbourhood; civil strife and turmoil in the Middle East; terrorism and threats to cyber security; piracy; illegal seabed mining in Indian Ocean and space-based threats present complex challenges to our defence capabilities. These require both conventional, as well as latest technological responses. Expressing happiness the Minister said, it is heartening to note that a large number of major systems are under production and the cumulative production value of all the DRDO developed systems has crossed Rs. 1,55,000 crore. ‘I am sure in the coming years, this figure will go even higher. DRDO must make relentless efforts to accelerate the pace of self- reliance’, he further said. The function was attended among others by the Minister of State for Defence, Shri Jitendra Singh, Chief of Air Staff Air Chief Marshal NAK Browne, Chief of Naval Staff Admiral DK Joshi and Director General DRDO Dr. VK Saraswat. 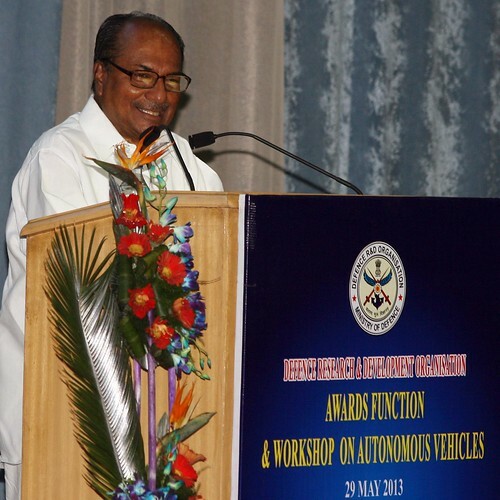 On the occasion, Shri Antony gave away DRDO Awards to several scientists, technologists and DRDO laboratories in fourteen categories for their outstanding contributions in different areas.